Everyone has seen the film right? The large reel, the guttural clicking of a Penn Senator reel before the noise becomes a scream as yards of line roll out faster than you can wind it back on! Most shark anglers live for this. For decades past, Cornwall was always the mecca for shark fishing. In recent years Wales has been challenging for this crown. Huge Porbeagle and Blue shark from these venues certainly make both worthy. What is lurking in the waters in our area? … I wanted to find out. Having had a keen interest in sharks for quite some time now and a deep desire to tackle one mysel hand to hand, the idea of targeting them from my home county Dorset had become very appealing. Now most anglers wouldn’t necessarily consider our area when looking for sharks but when I spoke to some of the commercial rod and line Bass anglers, they regaled tails of large sharks “bumping” Bass from their lines. Even a local spear diver had a close encounter off the west side of Portland when a shark came to look at the free lunch on the end of his rope! Proof there is something with teeth swimming in our local waters around Portland. With a little more homework, the culprit was found, the Porbeagle Shark. These large steely grey creatures are a close relative of the Great White, unlike the more pelagic Blue shark, the Porbeagle will hold to areas more rigidly almost territorial. Sharp drop offs, rough ground areas and wrecks make the ideal home. Everything the Portland area offers in copious amounts! This maybe a small shark but loaded with teeth! We are at the moment too far east to target Blue sharks with much success. I’m not saying they can’t be caught because the eastern half of Lyme Bay does throw up a few each year but they are not as common as you would find them in Devon or Cornwall for instance. Another shark that can be found in our waters is the Thresher, once again not very common and much harder to find (in fact I’m still looking for them!) The Thresher is classed as a game shark, long fast runs with jumping means you really have to tackle up for these as standard tackle is normally no match for them. 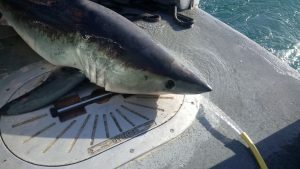 In the last few years I have been lucky enough to fish onboard a couple of local boats, targeting and landing Porbeagle sharks with a fair amount of success. The largest shark I’ve witnessed was around 250lb and over 7ft long with the majority around the 100lb mark. Recently a local angler captured his own aboard a charter boat from Weymouth estimated over 350lb!!! 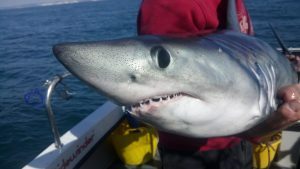 A 130lb+ Porbeagle having a quick photo before release. So, times are changing, more sharks are appearing in our waters over the last 2 years and what’s better is more people are fishing for them. 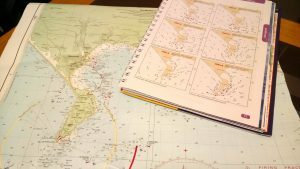 Luckily, if you are thinking of jumping on a charter boat there are now a good few boats offering this service in the area, but if you own your own boat where do you start? As with all fishing and especially a relatively little fished discipline such as Shark fishing even more so in Dorset, we are learning different techniques every time we are on the water. Over the next few months I will try to relay the knowledge I have gained so far, hopefully to help you to find your own sharks, the tackle I use, the chum, safe handling and welfare of these surprisingly sensitive creatures! I hope you have enjoyed the insight of what’s to come and here is wishing you tight lines until next time. Fishing Tails > All Articles > Reports > Boat Fishing > Shark Fishing …. Around Portland ??? 4 Responses to "Shark Fishing …. Around Portland ???" Very good article Paul look forward to the next one! We’re do I sign up? hey If you ever want a laid back companion to hang out with on a shark fishing expedition..Well im your man. I too have shark adventures swimming around in my head. For me the thresher is the mightiest of game fish superceding even the majestic mako But my thoughts have often hung around where the porgies might be lurking for those who are prepared to cast out a bait and wait. As you say .for the intrepid angler there may well be ground breaking experiences to be had. That’s been on my mind for a while. I think I’ll book a day out on a charter boat at some point. I saw the report on one caught in September. But if these are territorial creatures then aren’t they there all year round? I guess they’ll follow the food, mackerel herring etc. The next few years should be exciting. I look forward to reading more Paul.